A very short news-agency telegram from Monaco reached some evening newspapers in Britain before they went to press on this day 125 years ago. An English visitor, after playing continuously at the roulette tables here during the last four days, has just won a sum of £20,000. [Equivalent to £2 million in today’s money]. Occupying only three or four lines, and without mentioning the ‘lucky Englishman’ by name, the bulletin probably went unnoticed by the majority of readers. But very soon Charles Wells and his gambling success would be one of the main topics of conversation up and down Britain. Who wants to be a millionaire with offers like these?! Naturally the book is also available at many other bookstores on the high street and online. (Prices and details shown are as advertised online at the time of writing, 30 July 2016, and may be subject to change without notice). Lotteries are, as we all know, illegal in England and most other civilised countries, but an attempt is being made to introduce the system of State lotteries in Louisiana, which, in spite of the opposition of the Governor, may be successful, inasmuch as the Lottery Company offers to give $1,250,000 for a twenty-five years’ concession, the money to be applied to purposes of education, to pensions, and to charitable uses. The proffered bribe is a huge one, but Governor Nichols has hitherto stood firm, and will no doubt remain so; the question is whether he will be backed up by the State authorities. 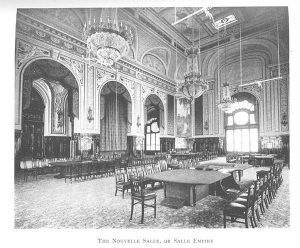 The principle behind the proposed lottery in Louisiana is rather similar to the arrangement in Monte Carlo, in which the Casino paid a substantial yearly amount to the royal household as well as financing public services such as the police, education, sanitation, hospitals and public works. 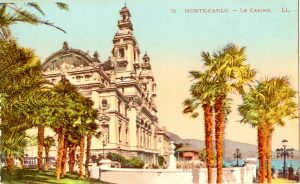 This financial support meant that the citizens of Monaco never had to pay taxes – a situation which still exists today. 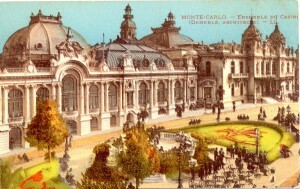 One person who took advantage of the existence of the Monte Carlo casino was, of course, Charles Deville Wells. 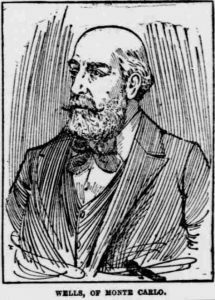 On this day 125 years ago he was spending his third day at the gambling tables, where he had already broken the bank several times. His story will be continued here over the next few days. 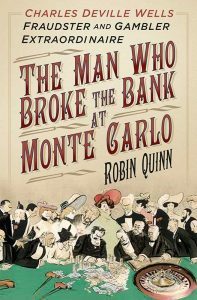 I used this resource extensively when researching The Man who Broke the Bank at Monte Carlo – Charles Deville Wells, gambler and fraudster extraordinaire, as well as my previous book, Hitler’s Last Army – German POWs in Britain. I have also used it when researching my own family history, and was astonished to find several references to my great-grandfather – including one where, as a young boy, he had a brush with the law having damaged a neighbour’s gate! 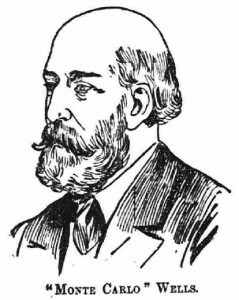 Having won the equivalent of hundreds of thousands of pounds on the previous day, Charles Deville Wells was now ready for a repeat performance. Although news of his exploits had not yet reached the British press, the ‘News in Brief’ columns of the Derby Daily Telegraph nevertheless carried some fascinating stories from around the world. Fortune has smiled on the explorers in the field of electrical science, says an American paper. No scientific body in the United States has so many millionaires as the American Institute of Electrical Engineers. [In his role as an inventor, Charles Wells had patented various electrical devices, including ‘electric baths’, and an ‘improved arc lamp’]. 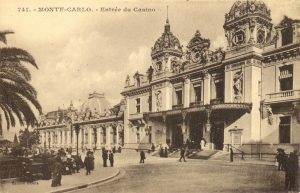 Recently there had been persistent rumours that Sarah Bernhardt, the world’s most famous actress, had lost all of her money at the tables in Monte Carlo, and had attempted suicide. The Casino appears to have been successful in keeping this adverse publicity out of the newspapers. Having recovered from the alleged incident, Sarah Bernhardt had just begun a tour of Australia. Madame Bernhardt is busily adding to her menagerie in Australia. She has already acquired a couple of splendid colonial dogs, a magnificent cockatoo, two laughing jack-asses, and a young kangaroo, which has become a special pet. The whaler Polar Star, which reached Dundee on Monday from Greenland, brought 70 tons of oil and three tons of whalebone, the value the latter at present being £2,300 per ton. She also has 426 seals, 20 bears, and one narwhal. The increasing prevalence of premature baldness is a fact now recognised by the medical profession. According to Dr. Joseph Tyson’s remarks in the Lancet, the principal cause, although not the sole one, seems to be the frequent covering of the head. Women notoriously lose their hair less often. The cause is found in the comparative lightness of their head gear.